	INEC raises alarm over fake voter cards, assure adequate security measures – Royal Times of Nigeria. 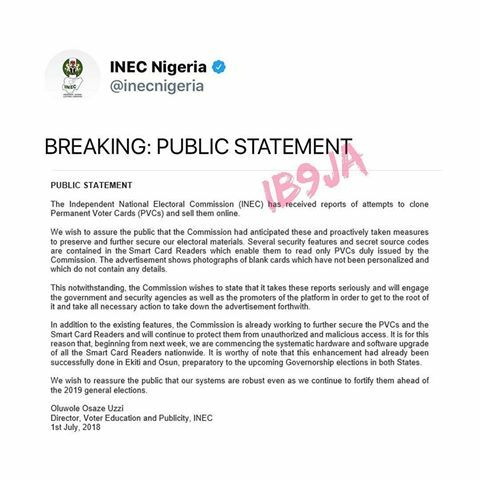 Ahead of the 2019 general elections, the Independent National Electoral Commission (INEC) said it has received reports of attempts to clone Permanent Voter Cards (PVCs) and sell them online. According to the commission several security features and secret source codes are contained in the Smart Card Readers which enable them to read only PVCs duly issued by the Commission. The advertisement shows photographs of blank cards which have not been personalised and which do not contain any details.